We are continuing to pay tribute here at Mr. X’s Punch Out to all the amazing African Americans that have stepped foot into the squared circle for Black History Month. We have already checked out one member of The New Day in Big E Langston, now we are checking out the man who once went from being Jamaican to being from West Ghana in Kofi Kingston. It’s hard to believe that Kofi has been with the company over ten years now, but he has done so much including a run for the Intercontinental Championship back in 2008. All roads lead to WWE Night Of Champions 2008 when he took on then IC Champ Chris Jericho at the American Airlines Arena in Dallas, TX. Going into the match, Jericho had no idea who his opponent was going to be so when Kofi’s music kicked on Jericho may have taken him lightly at that very point. Jericho established the early advantage over Kofi by grounding the high flyer and then punishing him with some kicks to the chest. Jericho thought he had the match though when he tried to throw Kingston over the top rope, but he bounced off of it and started delivering some haymakers to Jericho. When he went to hit the a flying elbow, Jericho was smart and left the ring, but he was met by a baseball slide and a springboard cross body from Kingston. Once he was back in the ring, he was met with another crossbody, but the advantage wouldn’t last long as Jericho tossed Kofi out of the ring. At this point, Jericho was in full control of the match as he targeted the back area of Kofi to try and ground him from being a high flyer and hopefully set up a walls of Jericho at some point. Finally after a while, Kofi was able to garner some offense surprising Jericho with some great shots and a hurricanrana. 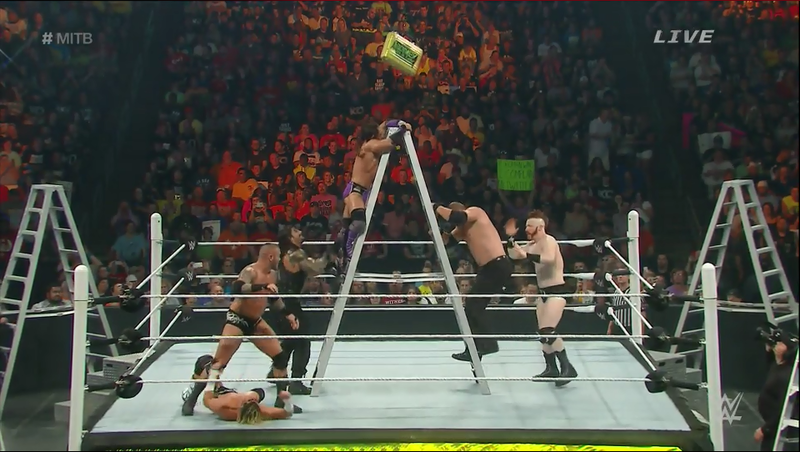 He would then attempt the boom drop, but Jericho tried to counter it into the walls, but Kofi wouldn’t let him and eventually he hit the boom drop. 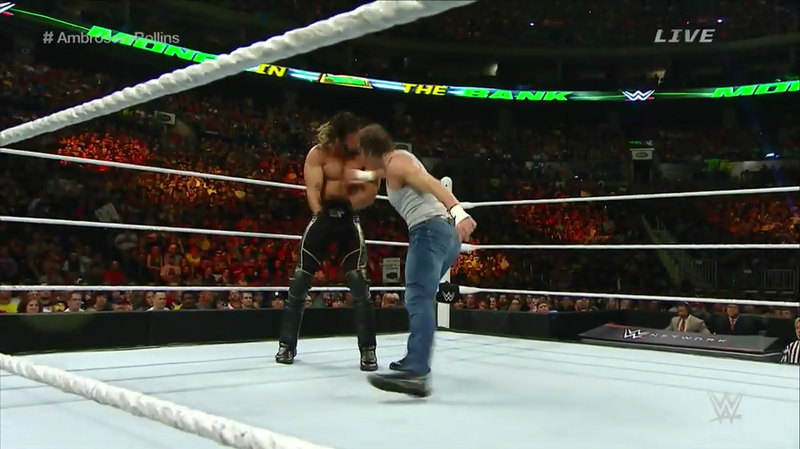 After he failed to get the pinfall, Jericho clotheslined him forcing the advantage to be back in his corner. Jericho would then execute an bodyslam and he followed it with the lionsault before he put Kofi right into the walls of Jericho. With his body in the scorpion position, Kofi needed a hope in the world to get out of it and his prayers were answered. All of a sudden there was a commotion in the crowd and it was the Heartbreak Kid Shawn Michaels who instantly superkicks Lance Cade. Jericho sees all of this happening and he instantly lets go of Kofi and shoulder blocks Michaels from getting in the ring. 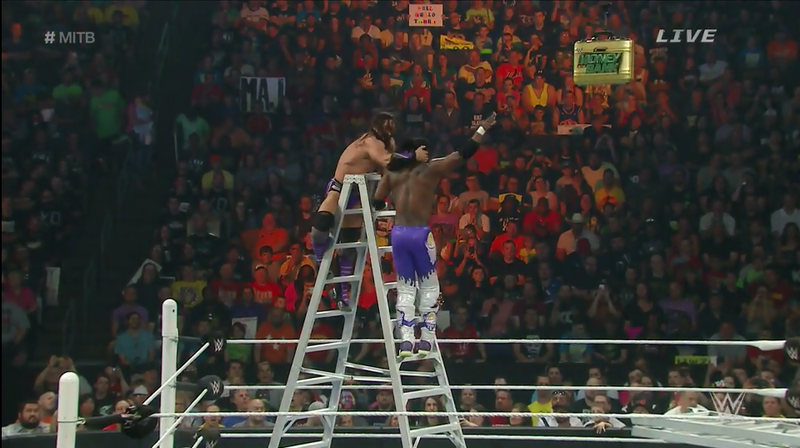 This provided Kofi with enough time to hit Trouble in Paradise as he pinned Jericho for the 1-2-3. 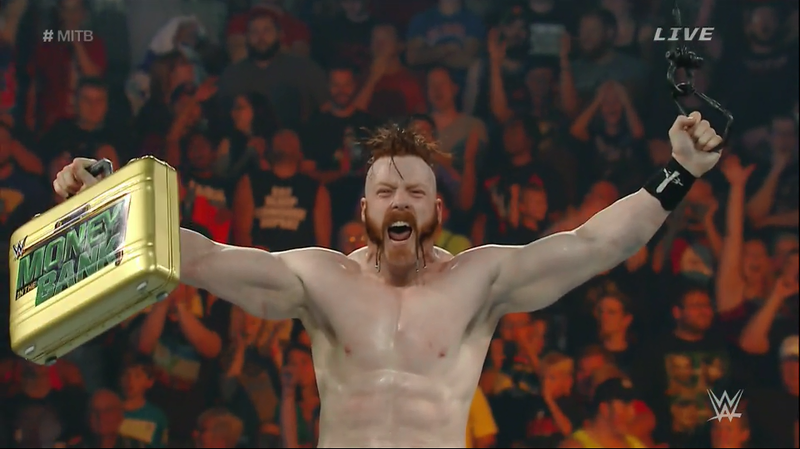 Kofi was your new Intercontinental Champion and the rest they say is history. After the match, Jericho would go on to strike Shawn Michaels out of frustration over the loss. 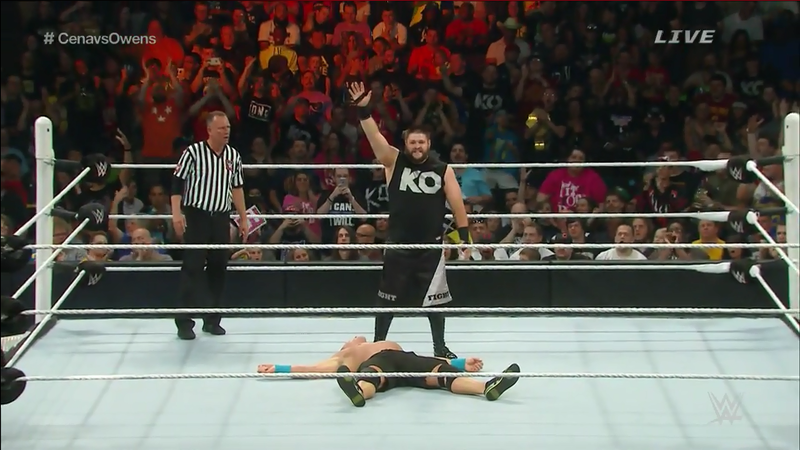 First I want to start my discussion by saying that John Cena was right in the fact that Kevin Owens does belong in the WWE ring. 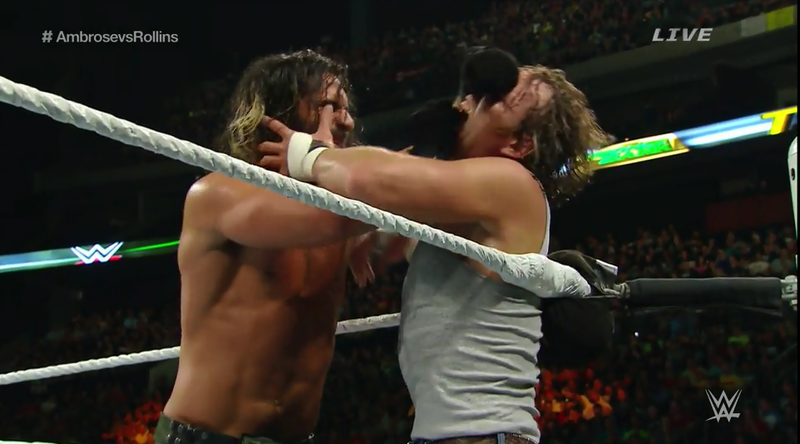 Those two guys gave it their all in the ring and provided us with another spectacular match. 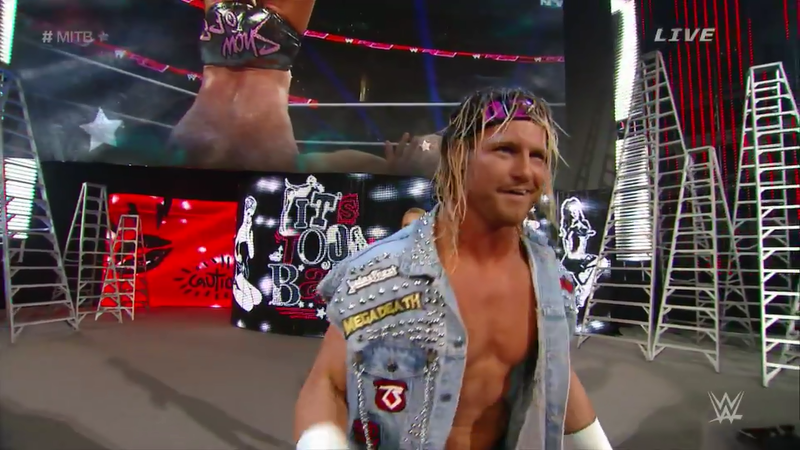 One of the things that I liked was at the beginning of the PPV, they rang the bell and had all the superstars out for the tribute and later on they had a special video paying tribute to him. Dusty Rhodes was a true American Wrestling Icon and legend that will be forever missed. 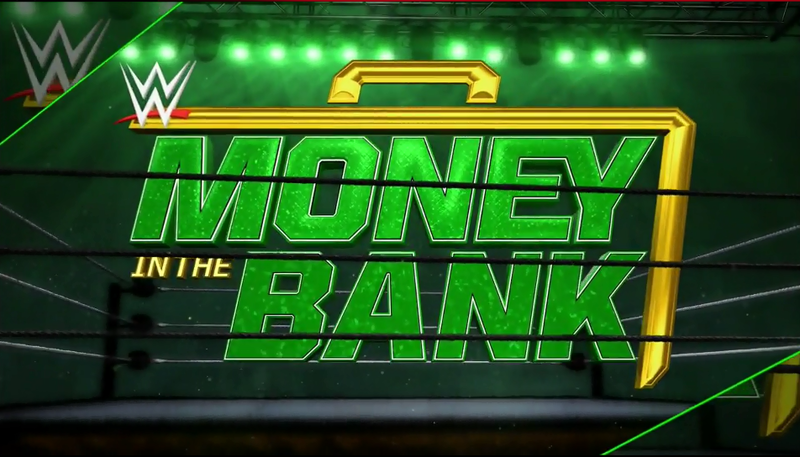 I was severely disappointed in a lot of the decisions that were made in the night like the WWE sticking the money in the bank briefcase with Sheamus, but I did like the fact that Roman Reigns will feud with Bray Wyatt. I was also disappointed with Paige not winning the WWE Divas title because I feel she is the future and she deserved to win. 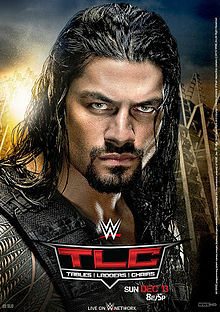 The Ryback/ Big Show match was a complete and utter disappointment thanks to The Miz, but it could have been a stinker. 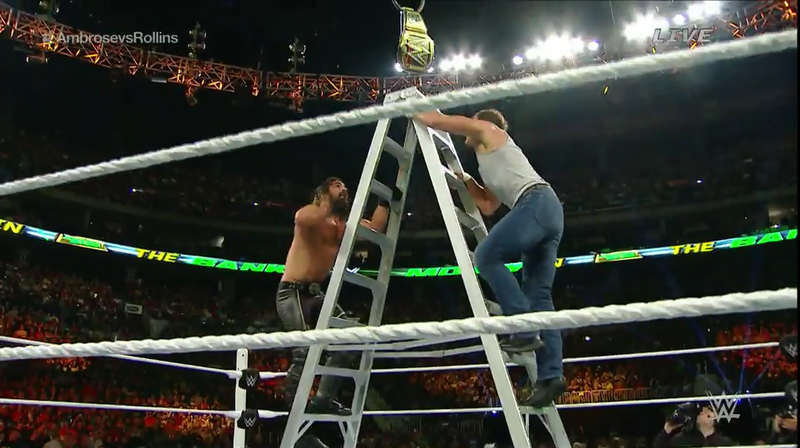 The Seth Rollins/Dean Ambrose ladder match lived up to the hype in my opinion and this rivalry is as good as it gets. 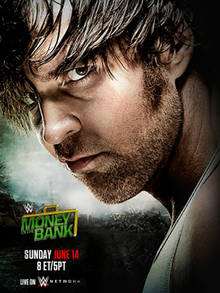 I am looking forward to future matches between the two of them. As far as the night went with my predictions, I went 2-5 which is another horrible PPV result, but what the hell are they doing with King Barrett? Chris Jericho to start The Highlight Reel said that the last time he had a Highlight Reel, he had predicted that The Authority would no longer be in power and tonight he was predicting that someone was going to come out in something tight, shiny, and either in the colors red, white, or blue. When Lana and Rusev came to the ring, Lana was wearing a shiny red dress. The promo was kind of lame with Jericho throwing childish insults at Lana and Rusev with Rusev eventually grabbing the mic and telling Jericho that maybe he would crush Jericho. Jericho then replied that he knows someone that wants to fight Rusev and then all of sudden Ryback’s music hits the speakers and the big man comes out to the ring. Rusev said some inaudible to Ryback, but he backed out of the ring and he left. 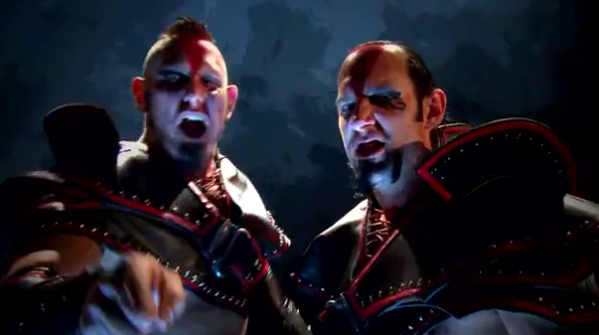 Before we came back from commercial break, we saw a pretty intense promo from NXT tag team The Ascension and it looked awesome as it ended with the screen saying, “The Ascension Will Rise.” Then we when we came back officially, The New Day came out to the ring to face Gold and Stardust in a rematch from last night. This time it was Xavier Woods and Big E taking on the Dust Brothers and they simply dominated the match all the way up to the commercial break. 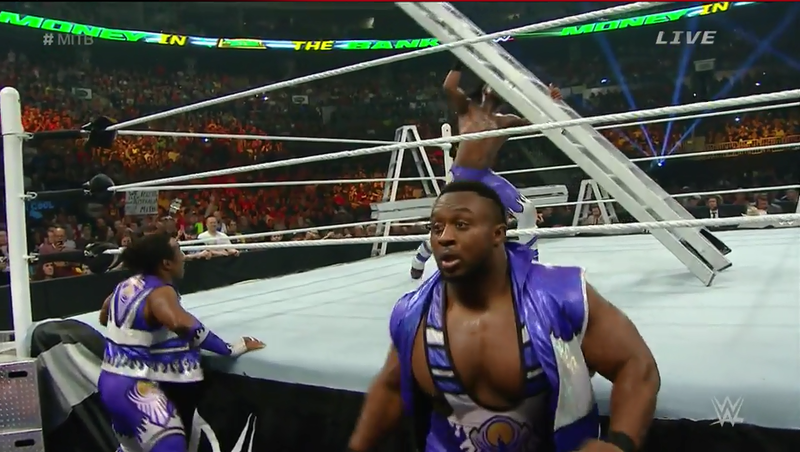 When we came back from break, Gold and Stardust were in control as they kept Big E grounded and off his feet. 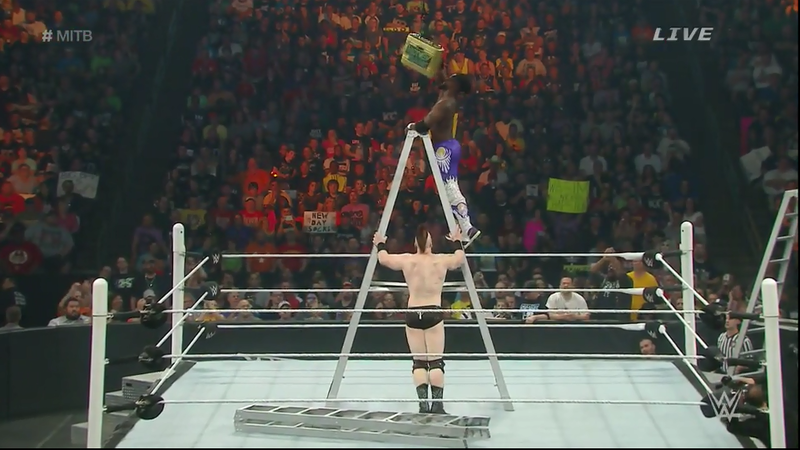 Eventually, The New Day took over the match and they were able to defeat the Dust Brothers again. 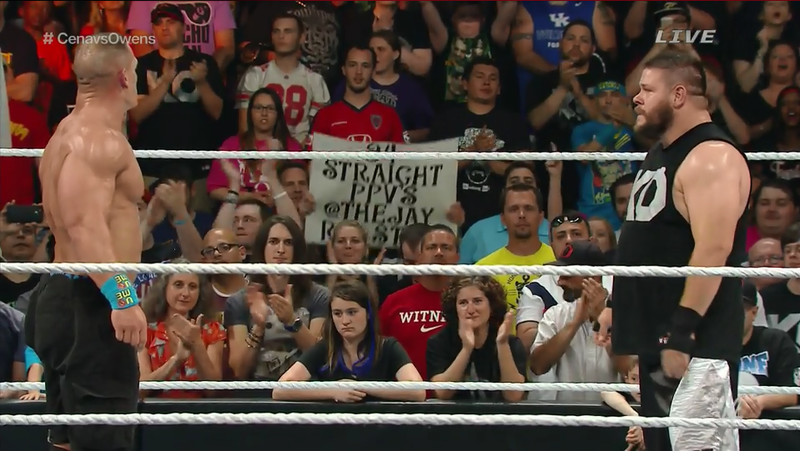 I don’t think the crowd was that impressed with Xavier Woods considering he was getting some boos. After the commercial break, The Miz and Damien Mizdow were cutting a promo with Renee Young regarding The Miz’s match with Jimmy Uso tonight on Raw. We also found out that Adam Rose was going to be in action as he told the Rosebuds that he was throwing an after party after his match. Then he was interrupted by Kane who was their to tell him that he was facing Adam Rose next. 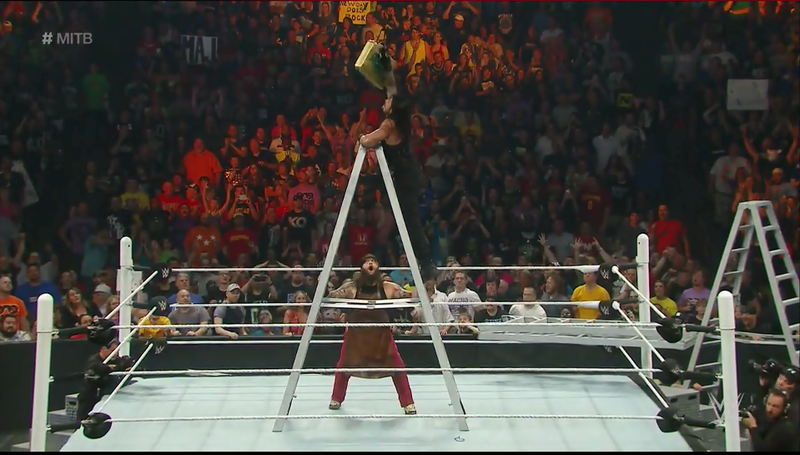 Adam Rose was doing too bad in the match as he was able to avoid most of what Kane was trying to throw at him. Then he showboated too early and he caught a big boot from Kane. Kane then went to deliver a choke slam and The Bunny climbed into the ring and Kane caught him and delivered a double chokeslam and then he pinned Rose for the win. 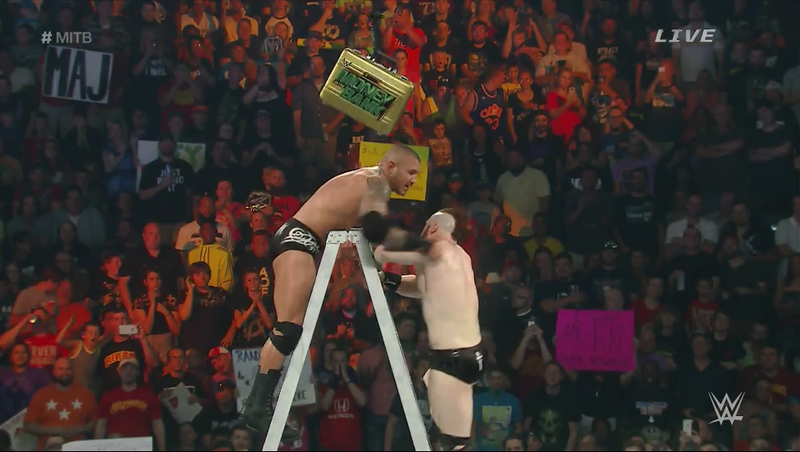 After the match, he delivered a tombstone to The Bunny which get the crowd excited. We all know something stupid and overdone we when we see it. The next match of the night was apparently the match between Chris Jericho and Paul Heyman. Paul Heyman came in begging for Chris to change his mind and even tried to write him a check, but Jericho slapped the check book away. Then when we found out that the WWE Universe chose a Street fight as the stipulation, Paul Heyman started to say that he didn’t understand certain things including why he would start a fight with the Beast Incarnate Brock Lesnar. 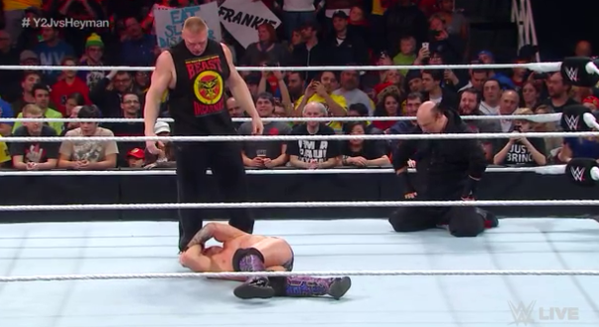 Brock’s music hit the speakers and the most dominate man came out and after circling the ring, he entered it. The two had a stair down and before you knew it they went at it. 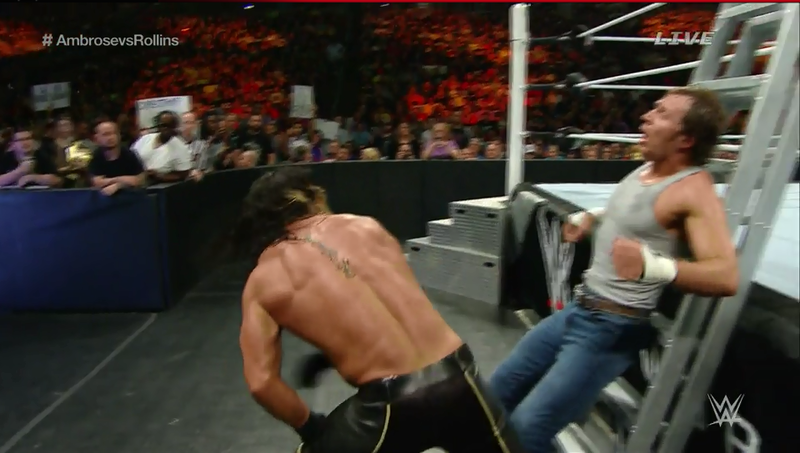 Jericho tried to hit a code breaker, but he failed and he received an F5 instead. Brock and Paul left the ring right after.